many benefits of handwriting analysis. I have prepared some of my newest and most requested ideas in the form of 16-30 page Special Reports. Many of these reports are chapters and sections from upcoming books, newsletters, etc... so you will be the first to read them. Each Report is jam packed full of entertaining stories, down-to-earth suggestions, illustrations, and easy to use advice and techniques to make your life a little easier and a lot more fun! Best of all... each Special Report is FREE! 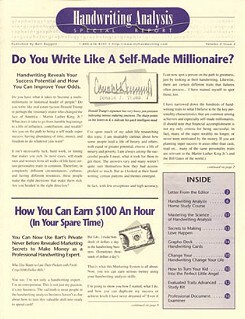 Go here to grab the latest downloadable introductory book/ special report about the basics of handwriting analsyis. Download your book now, for free. now. Go here to attend an upcoming 60-90 minute video training. These are 100% free and are occuring daily. Choose your Master Class Webinar Training Now now. ©2017 by Handwriting University, All Rights Reserved.